The winter 2014 issue of Ochsner Journal is a special internal medicine theme issue with articles commissioned by guest editor Dr. Indranill Basu Ray. The issue draws from more than 30 physicians who present a variety of topics related to the practice of internal medicine. Topics include heart failure, pneumonia, diabetes, and deep vein thrombosis. Contributing to the cardiac care knowledge base are articles on cardiac resynchronization therapy, interventions to repair ascending aortic pseudoaneurysms, current trends in supraventricular tachycardia management, familial hypercholesterolemia, and acute hypertension. Highlighting the connection between mind and body, Halsey Niles and colleagues examine Functional Genomics in the Study of Mind-Body Therapies, while Dr. Basu Ray’s contribution, Meditation and Coronary Heart Disease: A Review of the Current Clinical Evidence, looks at available data regarding the effects of meditation on the various aspects of cardiovascular health. Dr. Basu Ray is presently with the Tulane University Heart and Vascular Institute in New Orleans. His research interest is the connection between mind-body medicine and cardiovascular diseases, and he has studied the impact of meditation on medicine in general and on cardiovascular disease in particular. The winter issue also features abstracts from the 6th Annual Evidence-Based Practice/Research Conference presented by Ochsner’s Center for Nursing Research and the LSU School of Nursing. 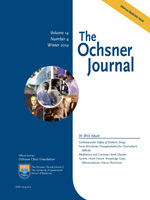 The complete winter issue is available at the Ochsner Journal website and through PubMed Central.